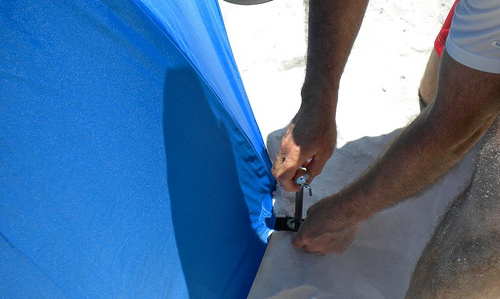 We like using this large beach umbrella because it is easy to put up and take down. Just open it up like you would a personal umbrella and either stake the pole in the ground or put it on its side and stake it in the sand with the side flaps down. 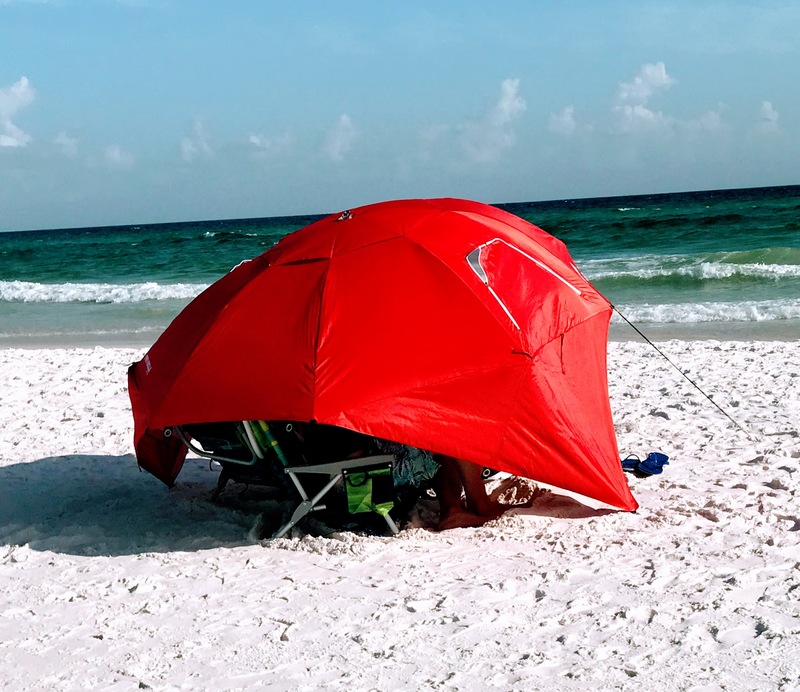 This beach umbrella tent has two different positions - one is upright with the pole in the sand like an umbrella and the other is on its side like the one pictured so it acts more like a tent to protect you from the wind or a pop up shower. It really does pop open just like a big umbrella - so quick and so easy. The pole is telescoping so it can be adjusted to a height that is comfortable for you. Thanks to the special fabric and lining, this umbrella with UV protection - it boasts a UPF of 50+ which means you are protected from 99.5% of UVA and UVB rays. 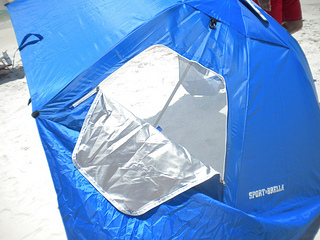 For less than $60 you have an investment in a piece of beach gear that you will use for years. We've had ours for over 5 years and it works and looks just like new. 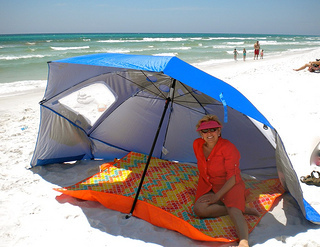 Here you can see the Sport-brella beach shade tent used more as a tent than an umbrella. It's anchored with lines on each side and pegs on the corners. For extra stability we use an umbrella anchor to hold the umbrella when it's in the upright position. The opening is wide enough to accommodate most size beach umbrella poles and a clamping screw secures the pole so it's tight in the stand. Made of heavy duty steel it will keep your umbrella anchored in the wind. When the umbrella is positioned on its side it can provide protection from the wind or from a sudden burst of rain. The side vents can be opened to provide a breeze on a warm day or zip them closed for a windy or drizzly day. By keeping the vents open the airflow prevents the umbrella from lifting up or blowing away. The vented top allows air to escape while stakes in the ground keep it right where it's suppose to be. The water repellent fabric keeps you dry if there's a drizzle or surprise rain shower and a protective undercoating blocks over 99.5% UVA/UVB rays. Included are 8 steel stakes and 3 tie down cords to secure your Sport-Brella. There is plenty of head room and space to sit in chairs rather than on the ground or on the sand. Kids can play in the sand with their sand toys but be protected from the sun. 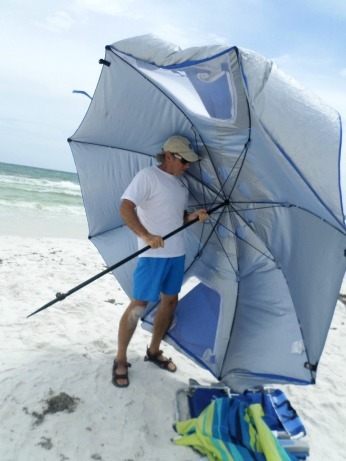 We have the regular sized Sport-Brella, which is 8' wide, but if you want an even larger one, the Sport-Brella XL Portable All-Weather Beach Umbrella. 9-Foot Canopy provides even more space - actually 9 feet - to keep you and your family in the shade. Be aware that the extra-large size doesn't fit into a normal car trunk but will fit into an SUV or mini-van. 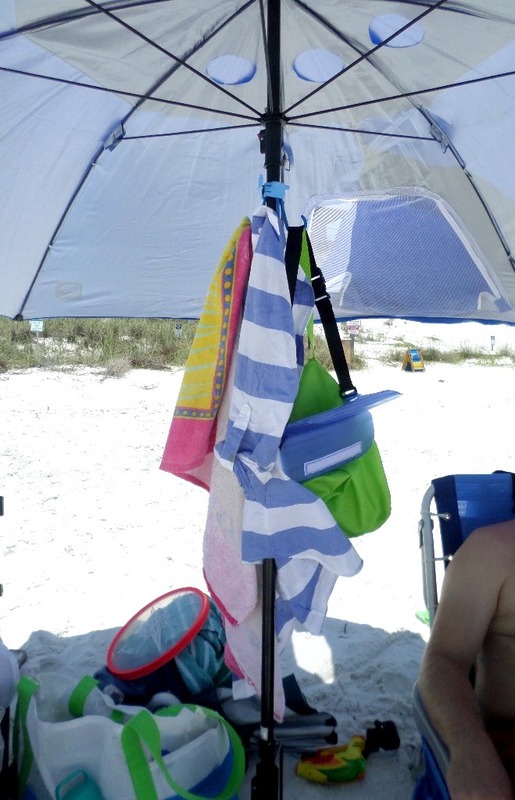 We love this beach umbrella hook - it clasps around the umbrella pole. Totally adjustable strap to fit a variety of size poles. An adapter is included for smaller 3/4" to 1" round poles. Made of all stainless steel parts making it durable and rust proof. 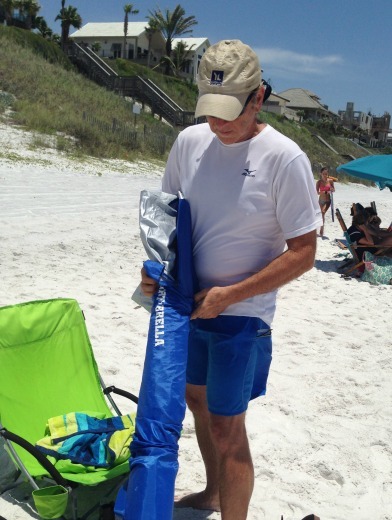 Hang your cover up, towels, sunglasses or light bag from it to keep stuff out of the sand or to help them dry. Remove the umbrella hook before closing the umbrella. 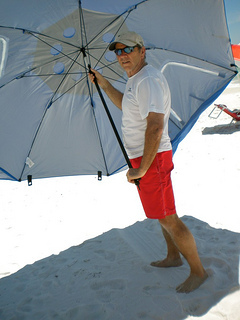 For several years we spent money to rent beach chairs and umbrellas when we went on vacation because we didn't want to hassle with setting up all the beach gear. 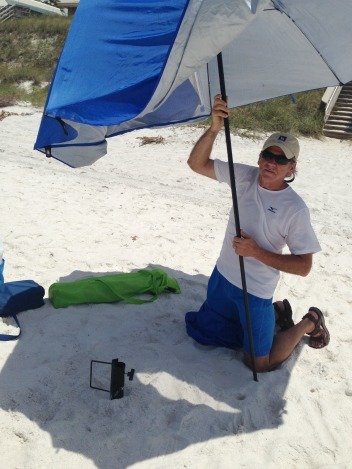 Thanks to this easy to use beach umbrella, we save ourselves a lot of money and stay protected from the sun.